Britain is hoping to ramp up talks in the EU in a bid to reach a withdrawal deal ahead of the looming October deadline. But there are dire warnings that Theresa May will find it difficult to get a deal passed in parliament. 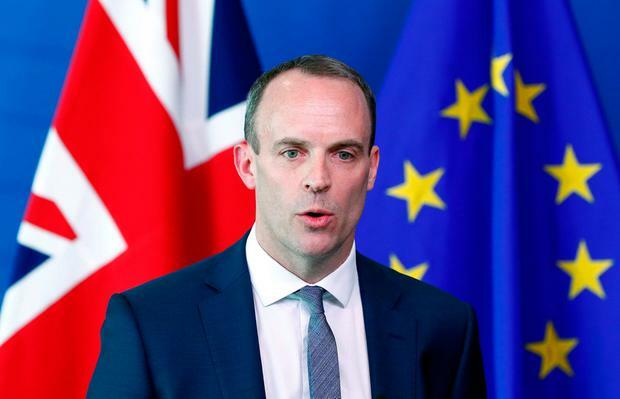 UK Brexit Secretary Dominic Raab will travel to Brussels tomorrow in a bid to pick up the pace of talks with the EU’s negotiator Michel Barnier. “On the agenda will be resolving the few remaining withdrawal issues related to the UK leaving the EU and pressing ahead with discussions on the future relationship,” Downing Street said. The latest effort to reach agreement on the outstanding aspects of the exit deal comes as influential Brexiteer Jacob Rees-Mogg, chair of the European Research Group, warned that unless the UK’s position changes any deal is unlikely to pass muster in parliament. Mr Rees-Mogg, who favours a clean break with the EU next March, said if the plans Mrs May announced at Chequers last month do not shift, she will have a more difficult time getting them through parliament. “If she sticks with Chequers, she will find she has a block of votes against her in the House of Commons,” said Mr Rees-Mogg, tipped as a possible successor to Mrs May. He described the Chequers proposals as “surrender” to the EU. The Chequers plan would keep Britain in a free-trade zone with the EU for manufactured and agricultural goods. But some Brexit supporters have said it would mean parts of the British economy would still be subject to rules set in Brussels. Both London and Brussels say they want to get a divorce deal at the October EU Council, but diplomats think that target date is too optimistic. If Mrs May cannot get a deal by October, an agreement could be reached in December. Mr Rees-Mogg said letting it run to December would be “very risky”, as it would leave three months to get the deal approved by the British parliament. Meanwhile, Agriculture Minister Michael Creed has said Ireland must redouble its efforts to maintain a close relationship with Britain post-Brexit. The UK’s decision to leave the EU was “akin to an elderly married couple divorcing having endured the tumultuous ups and downs of a rollercoaster marriage”, he said. Ireland is pursuing the closest possible trading relationship, post-Brexit, with the UK, and is working to secure the best possible deal in “challenging parameters” he said. “It will require a high and continuing level of political engagement, no little resources and a reaffirmation of the primacy of the Good Friday Agreement and the necessary investment of political capital to ensure, post-Brexit, that Northern Ireland does not re-emerge as a stain on our shared endeavour of many decades,” said Mr Creed. Ireland will “need to build new alliances and friendships, especially with smaller member states who share our outlook politically and economically”, he added. On Thursday, Britain will publish the first of a series of technical notices to outline how the government plans to mitigate the potential risks of leaving the EU without a deal and ensure continuity and stability.